This time around, Uber connected riders via plane! 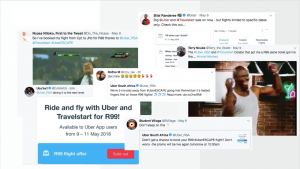 Through an amazing partnership with Travelstart, many Uber riders were able to find an escape or connect with their loved ones across various cities in South Africa. All it took was logging into the Uber app and booking their flight to their next getaway. The need to escape brought a lot of excitement to our Uber riders, which they shared with us on social media. Announcements are made through in-app messages and emails. Connect with us on social media, we’re bound to let you in on the latest. This was one of many initiatives Uber has lined up for you!